It’s no secret that I’m a huge fan of the uber-nerdy A Capella Science series on YouTube. 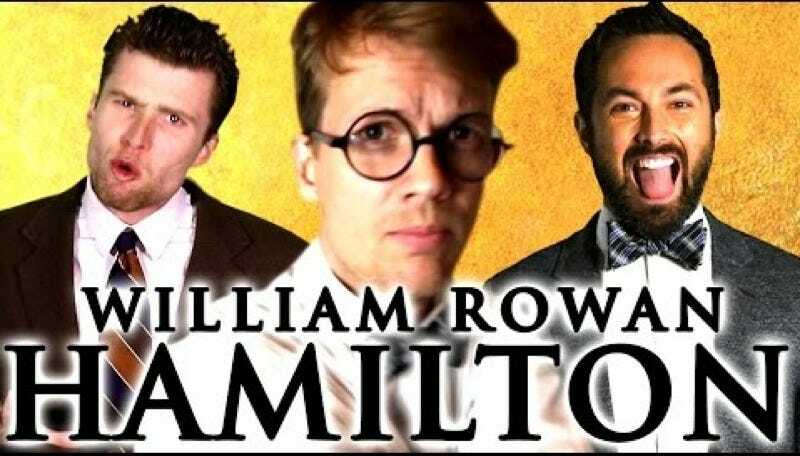 And now it’s back with another super-clever geeky video, parodying the hip-hop opening number of the smash Broadway musical Hamilton. Except in this case, the Hamilton in question is the Irish physicist and mathematician William Rowan Hamilton, who discovered quaternions, among other seminal contributions. He’s also behind the Hamiltonian operator, used in quantum mechanics to describe the total energy of a quantum system. It grew out of Hamilton’s elegant equations of motion for a dynamical system in the 1830s—the ones physicists use to describe the evolution of a classical planetary system, for example, or an electron in an electromagnetic field. What’s better than A Capella Science creator and physics aficionado Tim Blais bringing this parody to life? He’s already done a masterful send-up of “Defying Gravity” from Wicked, so another Broadway smash hit is a natural follow-up. This time around he’s helped out by an all-star lineup of YouTube science stars, including Veritasium, Baba Brinkman, Helen Arney, Tom Zalatnai, and Hank Green. Check it out!